If you have leftover eggnog from a holiday party, here’s an idea for using it up and creating a decadent dessert. It may also help you to use up some stale bread. I used some panettone that I bought at Presti’s bakery in Cleveland last month. Alternatively you can keep the eggnog and see how it tastes after a year or two, but if that grosses you out, or you don’t have sufficient fridge real estate for the eggnog to camp out all year, here’s a dessert for you. 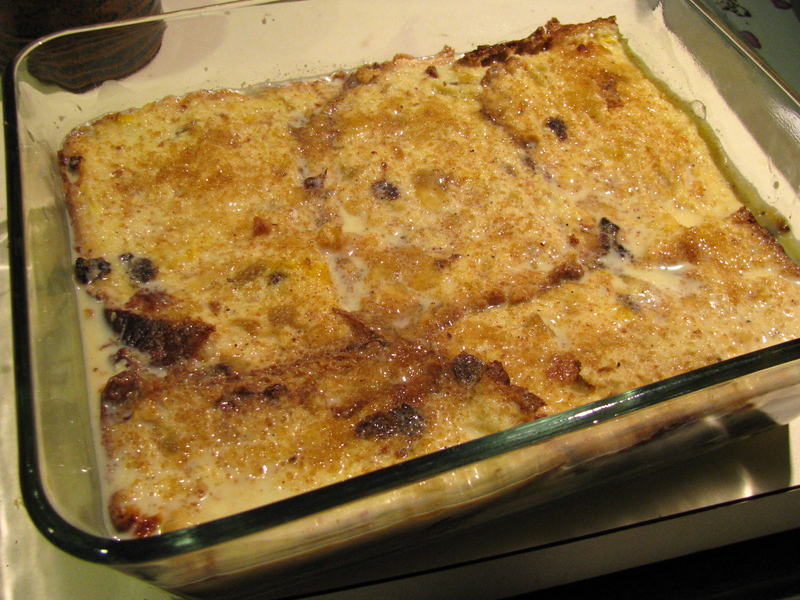 I made an eggnog bread and butter pudding using leftover eggnog, some additional eggs and sugar and panettone. You could also use sandwich bread, hot cross buns, french bread, brioche or any other sweet or fairly plain bread. 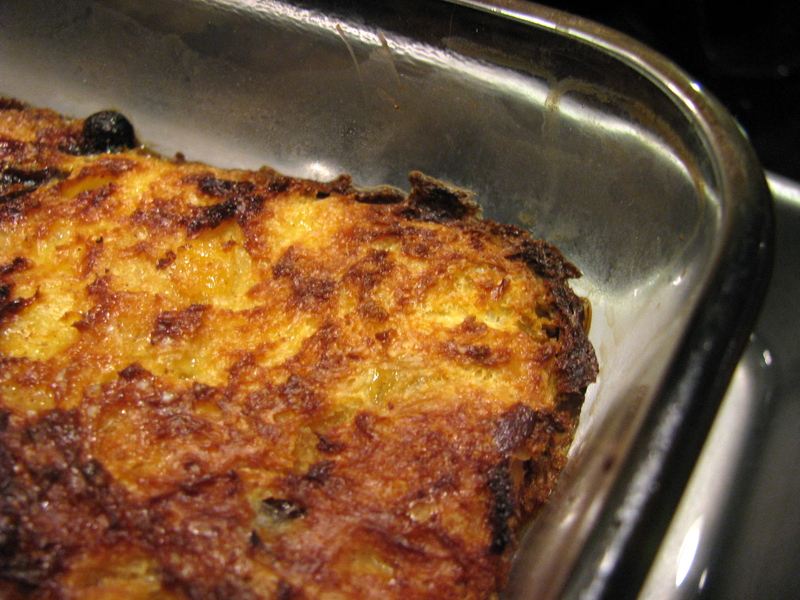 Here are a couple of basic bread and butter pudding recipes from Delia Smith and Jamie Oliver. 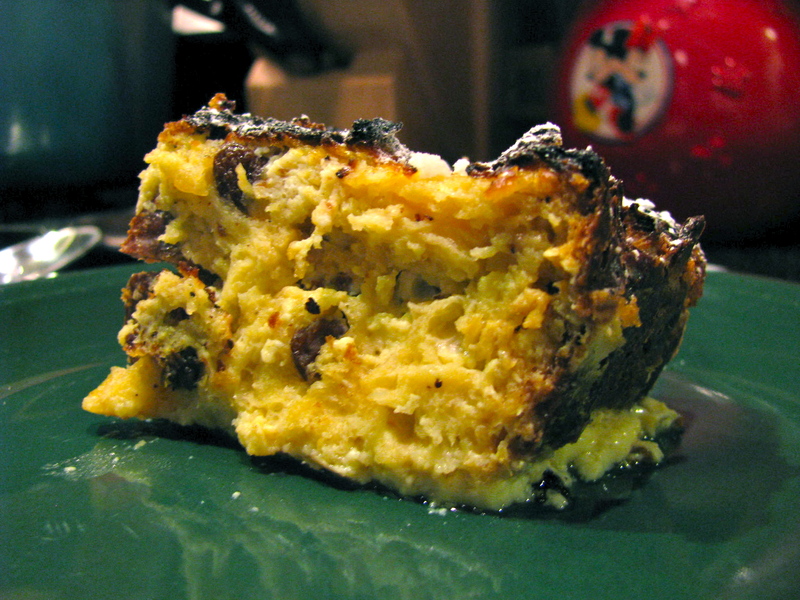 If you aren’t using panettone you might want to add some raisins, golden raisins or candied orange peel. Eggnog already has eggs, cream, sugar and alcohol in it. How you incorporate yours into the recipe depends on whether your egg nog was homemade or store bought, whether it is already alcoholic and how sweet it is. The homemade eggnog I used for the recipe was pretty alcoholic but not very sweet, so more sugar was required. I also added 3 more eggs. If it isn’t eggy enough the custard won’t set. It is important that you cook the bread and butter pudding in a bain marie (water bath). You can use a roasting tin and fill it with half an inch of water. The bread and butter pudding should get a nice golden brown crust on top and the custard should be set but slightly wobbly. Sprinkle with powdered sugar to serve. We had it with some Jeni’s brown butter almond brittle ice cream and it was a great combination. If it isn’t too alcoholic you could also use leftover eggnog as the base for a batch of festive french toast for a fun holiday brunch for visiting relatives. I’m not a big fan of eggnog, but egg nog french toast might make me very happy.